CELEBRATION & CLOSING RECEPTION of "UNBOUND AND REINCARNATED"
Six artists experiment with using books and maps to make unexpected and radical meanings. We are thrilled to show the work of Jenni B. Baker, Jill Bedgood, Sandra Fernandez, Ayden LeRoux, Jacqueline May and Jonathan Whitfill. Explore making artwork and poetry of your own with old dictionaries and recyclable books in our Creativity Room! 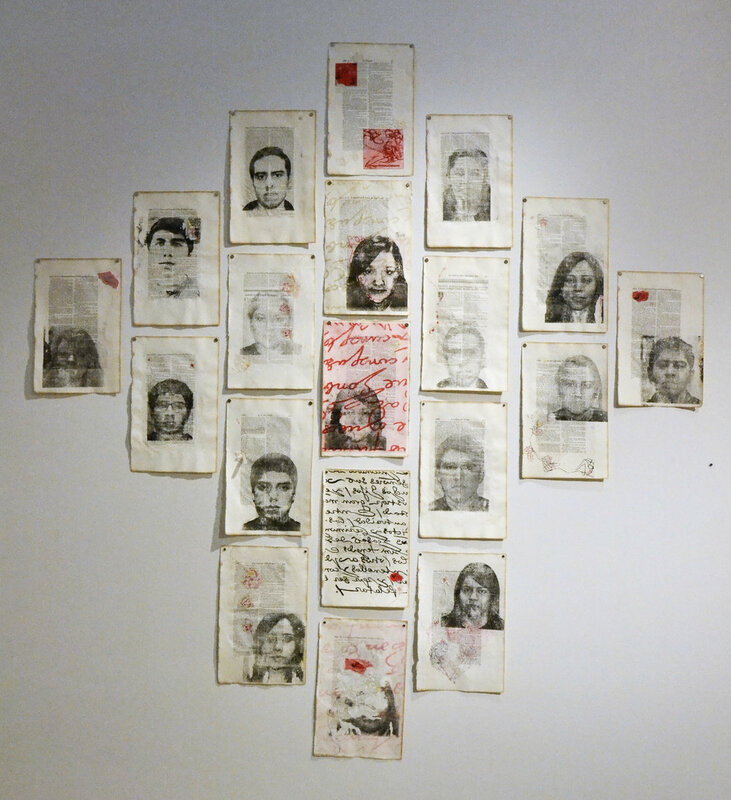 Sandra Fernandez lithographs faces of Dreamers (undocumented young people brought to the U.S. as children) on an 18th century collection of pages from a criminology text, above. Sandra also stitches maps of the US/Mexico border with embroidery thread to make visual metaphors. Thousands of Dreamers are currently threatened with deportation. Her work brings attention to this injustice. Experimental poet Jenni Baker takes original texts such as a 1967 Boy Scout Handbook and uses White-Out to erase words, revealing patterns and evocative language and imagery uplifted from the originals. This playful series explores complex issues like masculinity and social class. Jonathan Whitfill reuses found materials ranging from books to steel to create amazing new sculptures like the one above. Jonathan will be giving a free artist talk titled Intentional Retention, on Saturday, March 4th, at 2pm. The talk will explore his process and the role of reuse in the creation of his stunning work. Jacquelyn May's work above, "May Love Prevail," incorporates Braille text in an encaustic painting on a map; a tactile invitation to make art accessible. Artist Jill Bedgood, above, draws directly onto the pages of 20th century dictionaries as she explores how, "society’s definition of 'truth' is based on existing knowledge relevant to a particular time period." At the opening on March 3rd, we will have dictionaries and art supplies ready to go so you can create a dictionary drawing of your own! Ayden LeRoux's work above, "Untitled (Book Bed)" is a striking set of sheets made from the sewn-together pages of diaries and journals of famous women, dating advice and texts on the psychology of motherhood. They form a compelling examination of the intimacy advice given to women, and what women do with it. The pillowcase is sewn of dating advice from a book called "The Rules."